Print the cone below on tan or brown construction paper. 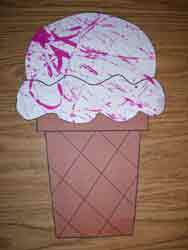 Print the ice cream on white paper. Put the ice cream page into a cake pan. Have the children drop a few eye droppers of paint onto the page.